All of my 2-meter handy-talkies and some hand-held test equipment are protected in the following way. A layer of paper towel is wrapped around the radio. A layer of Aluminum foil is then applied, totally sealing the device within the Aluminum. This is done three times. Then the assembly is wrapped in a paper towel, one last time and the whole thing is placed into an anti-static bag, along with any accessories, such as antenna, power pack, meters leads and such. The entire package is then placed in an appropriately sized cookie tin that my wife bickered about my stealing from her. I have most of my equipment protected this way. My next consideration is to purchase a couple steel trash cans and place all of my protected equipment in that. I'm sure that other people have their methods but this is what I have done after having learned some things about RF shielding when working on radio equipment for a commercial company where we worked in a fairly large faraday cage. Conventional RF is somewhere in the low microvolts per meter, and it is difficult to block, until you understand how to do so. An EMP generated pulse is somewhere between 30 and 100 kilovolts per meter. The current generated by microvolts is next to nothing, compared to the current induced by a 30 to 100 Kilovolt pulse. Did you know that if you have a spherical shaped metal container and you placed a billion volts on the surface, the entire inside remains neutral and totally safe, as long as you don't climb out of the thing before the surface charge is removed? Both Tesla and Van digraph proved this point. So, my point is that you really want to totally enclose things you want protected in a container that has good magnetic repelling properties. A magnetic field cannot go through Aluminum, it has to go around. That is the exact reason the old analog mechanical speedometers worked. It's called "Eddy" current and is a friction property of Aluminum to a magnetic field. That is why most of the shielding in radios and computers are made of Mu metal. Mu metal is a specially formulated Aluminum composition that enhances the penetration resistance of Aluminum to magnetic fields. EMP is a complex subject, to be sure. And what you need to know is that, much of what you read about EMP protection on the Internet is purely bunk! Take the Microwave oven, for example. The shielding in the microwave door is designed to prevent microwave energy from leaving the appliance during operation. The microwave pulse width of the Megatron in your typical microwave oven is much larger than the holes in the door shielding. But the initial EMP pulse will penetrate the shielding in the microwave door because the holes are much larger than the pulse width of the EMP pulse. The fact is, even using your high end gun safe may well be prone because the spaces between the door and the main cabinet are way too large. It is the very reason why your standard voltage spike protection for computers will not work - an EMP pulse is simply too narrow and too fast in the rise-time for conventional protection to be of any use. The EMP pulse will have come and gone, before the typical protection mechanisms even begin to respond. Layered, or nested, shielding here as well. Multiple thin layers of conductive material with insulation between provides better protection than a single layer, no matter how thick. Ungrounded being better unless you have some pretty deep pockets for materials and test equipment. Jerry Emanuelson at futurescience (www.futurescience.com/emp.html) has written a lot of articles on EMP, I sure hope he knows what he's talking about anyway. Is there any need for grounding the containers? Or is that something that should be avoided? There is much discussion on grounding. The thing is, the EMP pulse even gets into the earth and creates a ground wave. In the 1800s, the underwater intercontinental cabling became damaged because of the intensity of the CME arriving from the sun. Research has shown that destructive EMP energy had been seen as far as several meters below ground level. Some people argue that the protection should be grounded, other people say not to ground. Again, if a surface charge has no influence at the inside of a totally enclosed metallic enclosure, it shouldn't matter if that enclosure is grounded, or not. And as well, if the protective enclosure is constructed using a material that the magnetic energy cannot penetrate, there would be no need for grounding. I personally think that grounding protected equipment will be worse because then, you have a source of pulse energy from at least two places, a ground wave pulse and surface EMP energy pulse. Do you guys know if it's true that devices are less likely to be effected by EMP if they're turned off? There seems to be some debate on this, from what I gather, though I am not very versed in the subject. it won't matter.. Everything with transistors, chips, etc. will fry if not protected. Here are my two EMP containers. I hope it is enough! I plan on doubling the protection with Faraday bags anyway..
Use your rigs. Develop friends around the country and world. When the SHTF you'll know what frequency to go to. It will be one you and your friends have always used. Remember, when things suddenly get bad, you don't rise to the occasion. You fall back to your level of trianing and prepardness. Use your rigs. You can call it fun, socializing, prepping, contesting or whatever. A SHTF situation is not the time to be figuring things out. You want it all to be reflex. 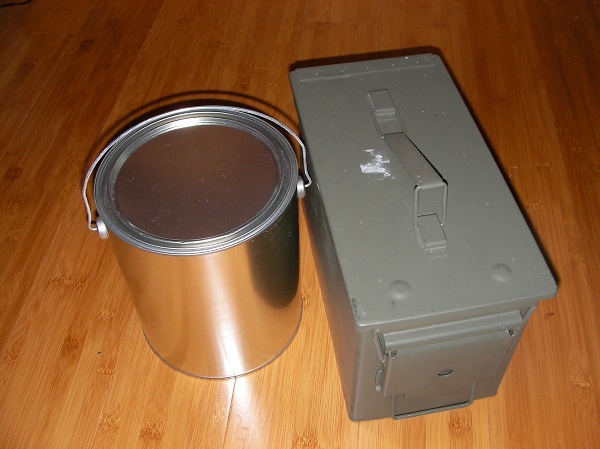 For radio gear, I have an old metal ammo box, I believe it was once used for mortar rounds. It measures about 2.5' x 1.5' x 1' deep, and it has a pretty tight seal. My "emergency" radio gear goes in there. I cleaned it up really well, and welded over the couple of small holes that had been drilled into it. I also welded a little buffer piece around the inside of the lid so that it makes contact all the way across with no gaps, then coated the inside of the box with truck bed liner. Thick cardboard cutouts are attached to the entire interior surface and lid using hot glue. Next will be to fill the inside with egg foam, then make cutouts for the equipment. The items themselves will be in foil-covered boxes nested in the foam, with the cardboard, hot glue and bedliner keeping them away from the metal surfaces. For other small electronics I may want to preserve, I have a 2-drawer filing cabinet that I up-armored to close off any gaps, then lined it much the same way as the ammo box. Will it work? Who knows? Hope I never have to find out. A couple of thoughts as I read through this came to mind. First, having worn a badge with a PD for 10 years and a FD badge as a medic for a like time, I can say this with some certainty. I think we will probably find that civil (or military) authorities in a major national disaster will be way too busy handling other things than to go track down folks transmitting harmless information via privately owned radios. That is just so far down the list of priorities that I would be greatly surprised if anything ever came of it. This is not the 1940?s. Weapons systems do not home on sporadic or broadcast radio signals anymore-unless they are directing military strikes. There is really no legitimate reason to suspend private transmit activities, unless they are a part of the problem which caused the emergency in the first place or interfering with the handling of that problem. And there is absolutely no way to enforce such a suspension. How many tens of thousands of transmitters would have to be tracked? And how many personnel would need to be dispatched to deal with ?illegal? transmissions? CB radio proved that task beyond the scope of even the federal government. Sure, anyone transmitting CAN be tracked with sophisticated equipment only governments can afford, but who would devote the resources of a military intelligence unit to finding a bunch of folks chatting about the weather on non-encrypted, non-frequency agile equipment? It just isn?t likely. If it was a pressing national security issue, then yes, they might come looking for you. I also seriously doubt the broadcast media would even heed such an order from a bureaucracy. They have a valid constitutional argument about public safety. In short, there will be much bigger fish to fry. Back to the original question. Where would I listen? Local law enforcement and fire first, and a good scanner is essential. Ideally, two good scanners ? one for LEO/Fire and another dedicated to aircraft (FAA) and other good sources of reliable information ? NORAD air defense frequencies for example. Would I listen to Ham VHF/UHF? Only in a minor way. Hams are just like everyone else. Very few really know what is going on at any given time. The same for CB and FRS. You can invest a lot of valuable time for very little really useful information. Most of my communications resources (local that is) would be dedicated to gathering my family and allowing them to avoid any known hazards. Beyond that, using ham resources; 20 meters during the daylight hours; 40 or 75 meters after dark. Listen much, transmit little-unless I really have something vital to say. Whew! My first post and way too much expounding on my opinions. AEJ5 - I think you brought up some interesting points. I too, believe that the nature of the event has some bearing on the response from a central control. The effect of having our entertainment deal with these matters can either confirm a fear, or produce that fear. So it acts as either a warning, or propaganda. If such (involvement) is the case - then we have to assume thatwhatever our plans are - those in authority have a pretty good idea of how the civilian populace will react. For instance, with so many transactions done by credit card - they have the ability to track purchases. The DHS and the FBI have even circulated handbills to retail owners asking them to help narrow the scope of their searches by notifying each agency of certain types of purchases (long-term food storage, weapons purchases, and large ammo buys) in which non-traceable cash is used. That means they know where any type of resistance would occur, geographically, and involving which segment of the population. Long-term food storage, weapons and Internet ammo purchases are all coming under scrutiny for a reason...adding to the worrying and troublesome behavior of collecting the means to provide for your sustainability and the means of protecting your provisions: the ability to communicate between like minded segments of the population (nearby and far away), would give us the ability to coordinate...and that would seem concerning to any centralized authority/entity, or rogue element entity, bent on control! Having the ability to communicate means they don't control what is being heard...and that would seem INconsistent with the concepts of control. So what do you think they would plan for? Do you think an entity that has become invasive - and made it their right to know what goes on under your roof, in your wallet, and bank account, would be caught off guard by something you would do? Do you think they haven't had a lot of practice subduing civilian populations that have lost faith in centralized authority? That has always occurred outside our borders - what if our centralized authority came to see a segment of (domestic) population - as a threat? What if either the entity we know as centralized authority, or a rogue element within that entity, is behind an SHTF event? It has happened numerous times in our hemisphere: when countries have weak economic conditions, high levels of dissatisfaction in their leadership, and that country suddenly undergoes some type of trigger event which allows for a heavy demonstration of power in order to attain stability. I feel that having learned and achieved certification in the basic concepts/capabilities of radio operating - is beneficial for any type of event. But I think that the ability to communicate - especially in specific geographic regions of the country - can and would be severely diminished, if not completely shut down. I used to live in the Panhandle area of Florida - if you we're anywhere near Eglin AFB you know the jamming technology is pretty pervasive. I would imagine any military base around the country the same type of thing occurs...now, if they have the ability to do that during times of peace and stability - what can they do in times of unrest and in areas they decide are unstable? Not affiliated with this website - just heard his story on a podcast and became intrigued. From the website, here is the introductory bio of the story:"Selco" survived the Balkan war of the 90s in a city under siege, without electricity, running water, or food distribution..."
His experiences caused him to start a school focused on teaching long-term survival skills to any interested - thats what his website is about...but hisstory is what fascinated me. I guess we all have our own motivating factors for what caused us to begin prepping...when I heard this mans story, it confirmed my thoughts and opened my eyes to things I could never have imagined...it also caused me to add other things to my Prepps.